The Associated Press Jung Ho Kang will be the starting third baseman for the Pirates. 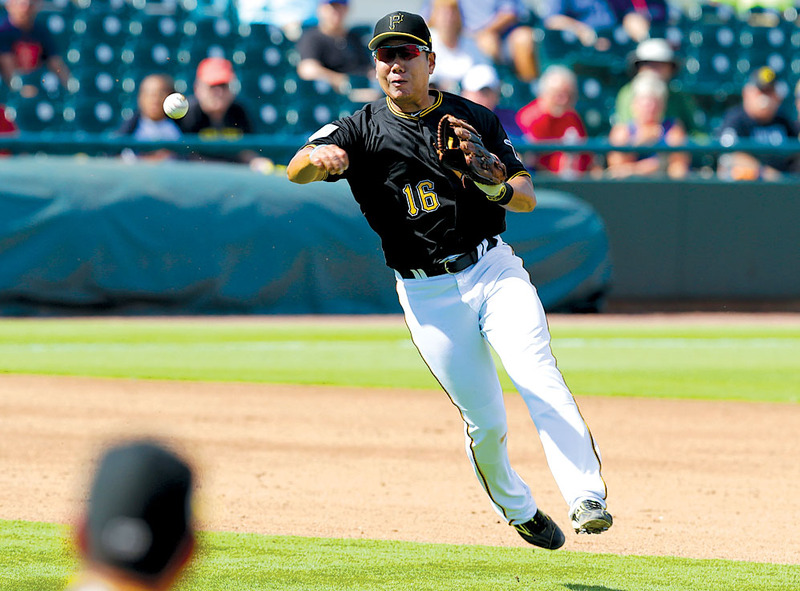 BRADENTON, Fla. — Jung Ho Kang and Erik Gonzalez have won starting jobs in the infield with the Pittsburgh Pirates. Moran was the Pirates’ primary third baseman last season as a rookie and will get some playing time at first base during the final days of spring training. PORT CHARLOTTE, Fla. — Nick Kingham threw five shutout innings in the Pirates’ 4-2 win over the Tampa Bay Rays on Monday in exhibition play. Kingham gave up just two hits and struck out four. He retired the first 11 batters he faced. JB Shuck went 2-for-5 with two RBIs. INF Kevin Kramer was optioned to Triple-A Indianapolis while LHP Brandon Waddell, RHP Geoff Hartlieb, Cs Christian Kelley and Arden Pabst, 1B Will Craig, 3B Ke’Bryan Hayes and OF Bryan Reynolds were reassigned to minor league camp. … RHP Jordan Lyles pitched a four-inning simulated game and threw 60 pitches. He said he felt fine after leaving his previous start last Tuesday after two innings because of cramping in his right side.